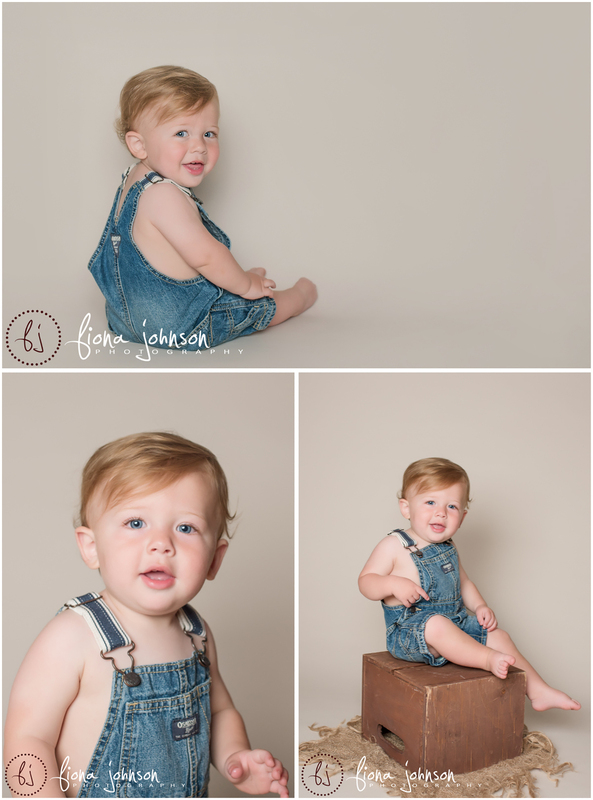 Blake was another adorable member of the FJP Baby Plan and was a star for his first birthday photography session. This Cake Smash Photography session concludes his 1st year of adorable photo sessions with me. He just gets cuter and cuter all the time. His first year certainly flew by, but I loved seeing him at 4 months, 7 months and a year old. I will certainly miss seeing him so often. I always tell the Moms as the first year comes to a close that it is time for another baby ;). Blake has such a great personality. He is an easy-going and happy little guy, and as you can see, he rocked all of his photo sessions. Those blue eyes…he’s already a heartbreaker! For Blakes Cake Smash session, we first took some regular portraits to get some classic shots before we introduced the cake. 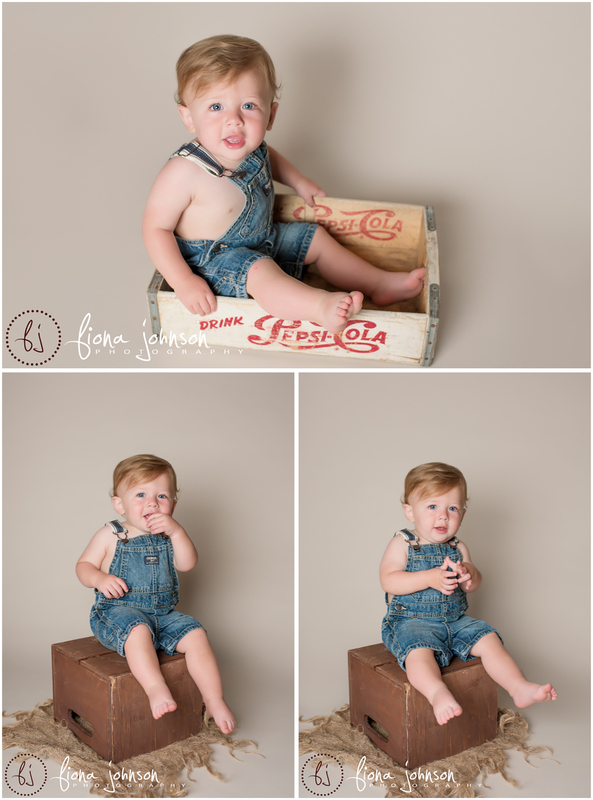 His little overalls made these photos so cute, but with that adorable face, I don’t think it would be possible to get a bad photo. We kept his cake smash simple with just Blake and the cake, and it was perfect. Simple is my favorite, so I absolutely loved the results of this session. Can I just say that cake looked absolutely delicious! Through Blake’s first year I watched his hair get blonder and blonder throughout the year. He had his first smiles, learned to sit up, started crawling, got little teeth, and finally started walking. It was a year of tremendous growth and I am so fortunate I got to document it. Blake’s First Year Storyboard Collage was included with his Baby Plan. It is so nice to see all the sessions from the first year come together in a beautiful work of art that can be proudly displayed in the home. The greatest thing about social media is that is keeps us connected to friends, old and new. I went to high school with this sweet little ladies gorgeous Mom, and we were lucky to reconnect at Vivianna’s Newborn Session. And because we have been friends on Facebook for years, I have been able to see their beautiful family unfold. This baby girl was so wanted and is so loved. Her big sister is absolutely adorable and will make a great friend to Vivianna. Not only is this little bundle completely adorable, she was so good for her newborn photo session. I brought my stash of baby girl outfits and props and she was so good to model a bunch of them for me. I actually woke her up at the end of her session to get a nice awake shot. And that head of hair…you can’t beat it! Welcome to the world Vivianna, and congratulations to your Mom, Dad and big sis! Thank you for visiting Fiona Johnson Photography. I am an in-home newborn photographer out of North Haven, CT. For your newborn photography session, I will bring my portable studio setup and all the props, wraps and outfits needed for your session. I have a bunch of colors to choose from, and a whole line of girl’s headbands. Being a newborn photographer, buying these adorable and props and outfits can become a bit of an obsession. I buy all high end props and outfits from vendors such as Roses and Ruffles and Pooks and Lulu, all well crafted pieces to use on your baby. I love neutrals and soft tones, but have been know to accommodate such themes as Winnie the Pooh and Harry Potter. I specialize in Newborn Photography, Maternity Photography, Baby’s 1st Year, Children and Family Photography. I travel throughout New Haven County, Fairfield County, Hartford County, and more. I will even cross the border in Westchester, NY. If you are looking for Maternity and Newborn photography, I offer a Belly to Baby Package, which includes both a maternity session and newborn session at a discounted price. I also offer a Baby Plan for the Baby’s 1st Year. This includes a number of Baby Milestones Session and a 1st birthday Photo Session. To book you maternity or newborn session, please contact me in your second trimester if possible. Last minute bookings will be accepted based on availability. You can rest assured knowing that I have been handling these sweet little newborns since 2006. I am experienced and safety is always my top priority. What an honor it is to watch a family grow and document it along the way. I first met Jacqueline and Frank when they were expecting Bella. Their maternity photo session was beautiful, and shortly after I photographed Bella as a newborn. And what a little doll she was. As you can see, she has grown into a gorgeous little girl, and was so happy to welcome her baby brother Frankie to the family. But not before another stunning maternity session as a family of 3. Frankie was absolutely wonderful for his newborn session in their home in Derby, CT. I set up my portable studio and got to work. I even got some little smiles out of him, as staple I try and get in my newborn photography. Congratulations Jaqueline, Frank and Bella! Fiona Johnson is an in-home newborn photographer serving all of Connecticut. Fiona travels through CT allowing the option to have your newborn photography in the comfort of your own home. With over 13 years experience, Fiona is in her element with newborn sessions. Each session is customized for a unique newborn photography experience. Please contact Fiona to book your session today. Fiona Johnson specializes in newborn photography. If you would like to book Fiona Johnson Photography for your newborn session, please contact her during your pregnancy if possible. Newborn photography sessions are best done before the baby is 2 weeks old for the sweet, sleepy poses. Fiona Johnson Photography does in-home newborn photo sessions, so you can keep the baby in the comfort of your own home. She will bring a complete portable studio to get you the best photographs of your adorable new baby. Fiona is experienced and educated in newborn photography, and has been in business since 2006. Safe handling of your newborn is a top priority during your newborn photo session, so rest assured that your little one will be in good hands. CT newborn photographer Fiona Johnson loves creating memories that you will cherish for a lifetime. The newborn phase is so fleeting and you will never regret having a newborn photography to treasure forever. Fiona will keep in touch before the shoot to plan your session, and you may choose a viewing and ordering session after the shoot or access to an online gallery to view and order. Fiona Johnson Photography is licensed and insured. Clients remark on her experience, patience, easygoing personality, professionalism, and talent. Book your newborn photography now with your newborn photographer ct, fairfield county newborn photographer, new haven county newborn photographer, hartford county newborn photographer in addition to maternity photographer ct, family photographer ct, and all your photography needs. Visit www.fionajohnsonphotography.com/ct-newborn-photographer for more information. At 5 weeks old, Alessandra was wide awake for a lot of her petite newborn photography session. But with this face, how could I complain. She is such a little beauty. Alessandra’s petite newborn photography session was done at her home in Wallingford, CT. I brought my complete portable studio setup, including my little bed prop and crib prop. Doesn’t she look perfect in pink?! Fiona Johnson an in-home newborn photographer based out of North Haven, CT. Traveling throughout Connecticut, Fiona allows the option to have your newborn photography in the comfort of your own home. She is in her element with newborn sessions. Fiona customizes each session for a unique newborn photography experience. Please contact Fiona to book your session today. Fiona Johnson specializes in newborn photography, maternity photography, baby photography, babies, children and families. If you would like to book Fiona Johnson Photography for your newborn session, please contact her during your pregnancy if possible. Newborn photography sessions are best done before the baby is 2 weeks old for the sweet, sleepy poses. Fiona Johnson Photography does in-home newborn photo sessions, so you can keep the baby in the comfort of your own home. She will bring a complete portable studio to get you the best photographs of your adorable new baby. Fiona is experienced and educated in newborn photography, and has been in business since 2006. Safe handling of your newborn is a top priority during your newborn photo session, so rest assured that your little one will be in good hands. CT newborn photographer Fiona Johnson loves creating memories that you will cherish for a lifetime. The newborn phase is so fleeting and you will never regret having a ct newborn photographer capture the details. Book now with your newborn photographer ct, fairfield county newborn photographer, new haven county newborn photographer, hartford county newborn photographer in addition to maternity photographer ct, family photographer ct, and all your photography needs. Visit www.fionajohnsonphotography.com/ct-newborn-photographer for more information. Fiona Johnson Photography does custom portrait sessions for a first birthday photography session. Whether you want a simple cake and the baby, or a themed cake smash, Fiona Johnson Photography is the fit for you. First birthday photography sessions are done either in your home or at a local outdoor location.